Fantastic piece of property. Perfect for the hunter who wants to create his own private reserve, or for the family who wants to build away from it all. Tucked away and private!!! County gives address as "off Burns Road". The property is physically accessed via Buck Spencer Lane. This property has been in the family for generations, with access via this road, though no formal access agreement has been found. Seller does not have a current survey of the property - acreage amount taken from county tax records. Acreage total and legal access should be verified by buyer/buyer's attorney/buyer's surveyor. 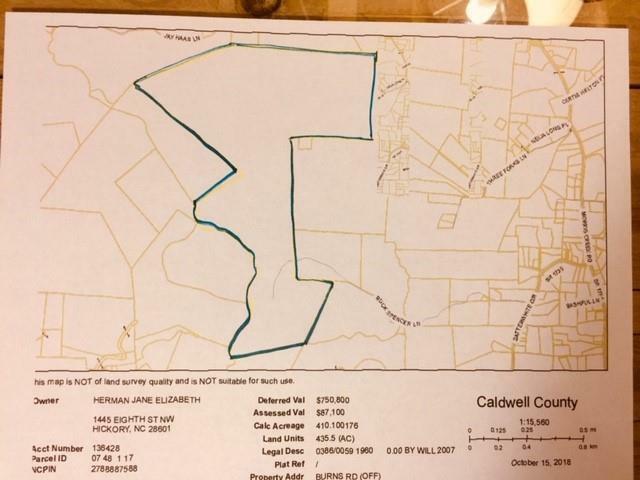 Offered by Classic Properties Of The Catawba Valley, Llc. Copyright 2019 Carolina Multiple Listing Services. All rights reserved.